SmartRags. The Smarter Tool For All Tasks. Microfiber Cloths - 80% Polyester, 20% Polyamide. 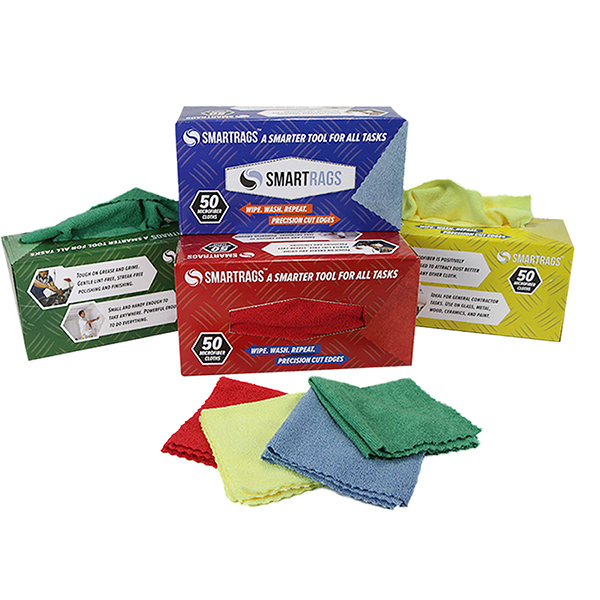 These microfiber cloths can be laundered up to 500 times, are lint-free, can be used wet or dry and are available in multiple colors. Microfiber Waffle cloths - have a textured finish that is more abrasive than traditional cloths. Used for heavier soils that still require a streak-free finish. Microfiber Suede Window Cloths - The smooth texture easily releases particles with rinsing. Great for delicate cleaning and polishing , the cloth produces a streak-free shine. Microfiber Blue Shiny Glass Cloths - 80% Polyester, 20% Polyamide. Glass cloths can be laundered up to 500 times are lint-free, have a smooth texture easily releases particles with rinsing and reduce the amount of chemical needed for cleaning. Microfiber Wet Flat Mop - A JanSan staple, microfiber flat wet mops are perfect for hard surface dirt removal prior to polishing. RGB color matching with Monarch Brands floor care lines prevents cross contamination. Microfiber Tube Mops - 80% Polyester, 20% Polyamide. Looped end flat mops feature a durable tube strand design, sewn tail band a and a nylon mesh headband. Microfiber Scrubbing Wet Flat Mops - 80% Polyester, 20% Polyamide. 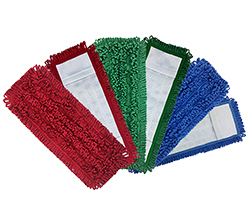 Scrubbing wet flat mops have durable double stitched edges, a velcro® 5.5” wide backing scrubbing strips that you can launder up to 500 times. Microfiber Pocket Mops - feature microfiber ‘fingers’ to trap more dirt. Our pocket mops are more absorbent than competitor brands, feature an industrial strength canvas backing and matching hardware (sold separately). Microfiber Econo Wet Mops - Designed for a lower price point and slightly shorter life span. If you’re in an environment with loss mops or frequently mishandled product, these are great options for lower price points. Mesh- Backed Pocket Mop. 100% Microfiber mesh backed for a stretched snug fit. Mesh construction dries quicker than traditional canvas pocket mops. Microfiber Horizontal Stripe Scrub Mop - Our industrial strength flat wet scrub mops are larger than standard scrubbing mops and feature tough polypropylene ridges. Microfiber Fringed Dust Mops - Cut center and looped end fringe with a brushed brushed 6.5” Wide backing. Available in 18", 24" and 36" lengths. Fringed Canvas Backed Fringe Mop - Cut center and looped end fringe, this mop comes in sizes up to 72" wide for efficient hall cleaning. Wall Washing Pad w/ Telescopic Pole extends from 28-48". The lightweight system alleviates fatigue uses the same 10" pad as the trowel. Wall Washing Trowel w/ Chisel Tip is ergonomically designed to lessen strain on the wrist and uses the same 10" pad as the pole.